Arthritis is a form of joint disorder that involves inflammation and stiffness of one or more joints (the region where two bones meet). For many patients, many types of arthritis are systemic, which means that they not only affect the inflamed joint, but it can also affect the entire body as well. Although most people tend to perceive arthritis as a single disease, arthritis is actually a term used to describe over 100 medical conditions that affect approximately 46 million adults and 300,000 children in just the United States. By 2030, it is expected that the number of adults affected by arthritis will climb to a staggering 67 million. Which is known as the “wear and tear”arthritis. Osteoarthritis occurs when the cartilage cap located on the ends of bones slowly wears off. Without this cartilage protection, the bones will start to rub against each other, leading to pain and inflammation. Osteoarthritis can affect any joint but it most commonly affects the hands and weight-bearing joints like the knee, hip, and facet joints. Which is a chronic inflammatory form of arthritis that occurs when the body’s immune system is not working correctly, and commonly affects the hands, wrists and knees. Rheumatoid arthritis is an auto-immune disease in which the immune system accidentally mistakes good cells as a foreign substance and starts to attack. This can eventually lead to damaged cartilage and bones. Which is a painful condition that develops when the body cannot get rid of a natural substance known as uric acid.When the excess uric acid cannot be expelled, it starts to form needle-like crystals in the joints that cause swelling and severe pain. Gout most often affects the big toe, knee, and wrist joints. 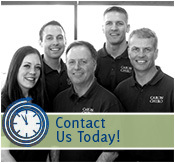 Chiropractic Care at Caron Chiropractic Clinic can Help with Your Arthritis Conditions! Chiropractic care is one of the leading treatment options for pain relief. In fact, studies over the years have shown that chiropractic care is effective in alleviating arthritic conditions. Unlike conventional forms of medicine, chiropractic care follows a “hands-on” holistic approach to healthcare and healing. Chiropractic care treats your body as a whole by focusing on improving your complete health in an effort to reduce the risk of pain and illness, not just a “quick fix”. If you have any questions about arthritis, or would like schedule an appointment, call Caron Chiropractic Clinic today at 612-255-9999! This entry was posted	on Wednesday, April 30th, 2014 at 7:14 pm	and is filed under Arthritis, Chiropractic, Chiropractic Treatments, Joint Disorder. You can follow any responses to this entry through the RSS 2.0 feed. You can leave a response, or trackback from your own site.